Create easy peel-off message pads, note pads, form pads and multi-part form sets with a padding press. A padding press allows you to squarly stack your forms against an alignment panel, then press the stack with a secure clamp bar. Once your forms are stacked and clamped you then remove the alignment panel and apply the padding adhesive with a brush. 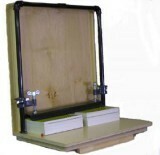 Padding presses are available in small bench top configurations to large floor standing models. When greater production of pads is required automatic padding equipment is available. Cold padding adhesive is available for brush-on padding and a specially formulated hot-melt adhesive is available for automatic padding machines. Padding accessories include; pad counters, padding brushes, padding knives and chip board. Multi-part form production is created using carbonless paper and Fan-Apart Adhesive. The Fan-Apart Adhesive only attaches itself to the treated side of the carbonless paper. When the adhesive dries you release the padding press clamp bar and simply "Fan-Apart" the stack of forms causing separation at the non-treated side of the carbonless paper; creating individual mult-part sets. 3 times faster than clamp and brush mehtod"! Automated Production Padding; quick, efficient, foolproof!